Punjab Optics deals in wide variety of frames, lens and sunglasses. A qualified Optician and Contact Lens Specialist is available. 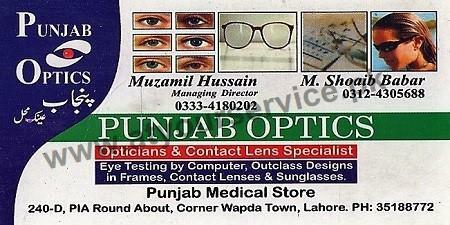 Punjab Optics is located at PIA Round About, Wapda Town, Lahore. It deals in wide variety of frames, lens and sunglasses. A qualified Optician and Contact Lens Specialist is available.